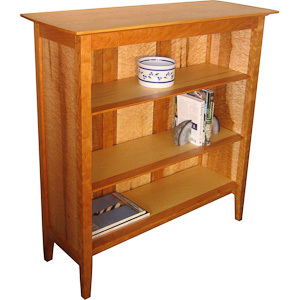 This beautiful bookcase series comes in several sizes each with adjustable shelves. The solid wood construction uses classic mortise and tenon as well as dovetail joinery to secure the sides to the front and back. The panels on the sides and back float in a concealed dado joint. Characteristic of the Boothbay series, the top and shelves have the coved edge detail to reveal a crisp delicate edge yet made from thicker wood for strength. The top side edges also have a gentle curved edge instead of a traditional squared off top. Again this matches the detail found on other Boothbay furniture pieces. This piece is just as beautiful from the back with its beautiful floating panels that it can be used as room divider. This piece is made from cherry with hand selected birds eye maple panels. Below is pricing for other types of hardwoods. Other sizes are available as a custom design. Please inquiry about pricing for other heights and options. A mixed wood option is available. Please add 15% to the price for mixed woods using the higher priced wood.